Navigation: Weblog / Blog article: THE CHEAPEST DIM SUM IN PENANG? After patronizing more than 14 dim sum restaurants within the Georgetown vicinity, I had found one that suited my taste best. Surprisingly, this barely a year old restaurant is the sister company of the famed Restoran Zim Sum along Jalan Anson and they do share the same premise with another sister company named The Steamboat Restaurant along Jalan Macalister, Penang. The name of this restaurant is Dim Sum Food Restaurant. When I mention about being the cheapest, do not have the wrong perception as in monetary terms or on the restaurant serving extremely cheap food. I had based my judgment on the quality, freshness and amount of ingredients used in each of the dishes. Moreover, the food here did fill the two of us here until the beam. Let me share with you my experiences of dining in this restaurant. Not many restaurants in town would provide quality and delicious dim sum from Shanghai or Hong Kong and at the same time at an affordable price but this restaurant proved me wrong. The have Gyoza (Jiaozi – 餃子) , Egg Dumpling (蛋餃), Shanghai Sheng Jian Mantou (生煎饅頭) and many more at less than RM3 for a plate of threes. Just to try them out without overeating, I just ordered one of each at RM1 per piece. That’s cheap in my context as I had paid RM8+ before just to savor 5 pieces of smaller sized Gyoza in other restaurants. The Gyoza was great and had the mild crisp still on the skin and the filling was well stuffed wile maintaining its juiciness. It went well with lots of young ginger strip soaked in black vinegar. The Egg Dumpling tasted great as well although it looked just like an egg coated dumpling. 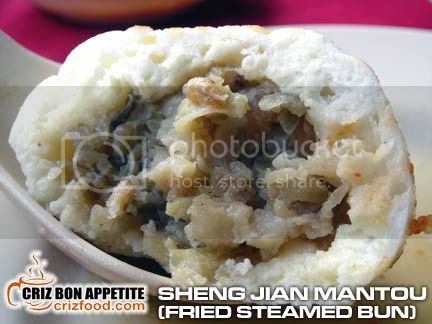 What impressed me more was the Sheng Jian Mantou (Pan Fried Steamed Bun), a common street food in Shanghai. The filling within was so compact and it has lots of ingredients such as minced pork, chopped shrimps, jicama and mushroom seasoned with a mild fragrant taste from some dashes of sesame oil. This is a must try. Just for information purposes, you might want to know how to differentiate the many versions of the Chinese dumpling, Jiaozi (餃子). Depending on the way these dumplings are cooked, boiled ones are called Shuijiao (水餃), shallow pan fried ones are called Guotie (鍋貼) and steamed ones are called Zhengjiao (蒸餃). 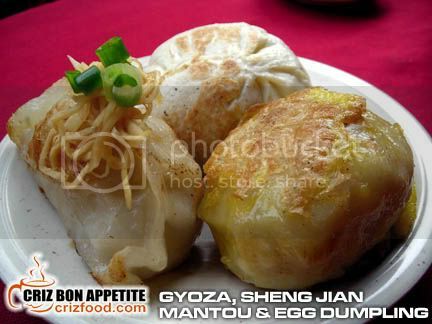 Some people may use egg as the wrapper or coat the Jiaozi with beaten eggs prior to frying. These would be called Danjiao (蛋餃/蛋餃子). 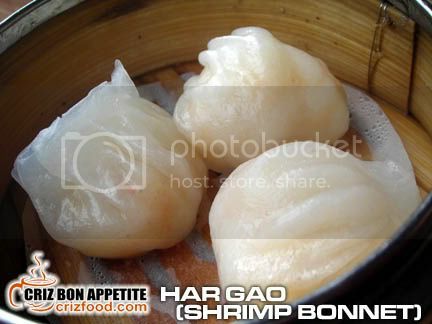 Next was the Har Gao (Shrimp Bonnet due to its pleated shape). The skin was so thin that the basket of three looked so translucent. With the freshness of the mildly seasoned prawns, the whole dumpling just melted smoothly inside my mouth. In most of the dim sum restaurants locally as well as those from Taiping, Perak, you would get Siu Mai (Pork Dumpling) as a common item. This restaurant had put in the extra effort to have some prawns in the dumpling, thus making them into Har Mai (Prawns and Pork Dumpling). The best part was that they have four in the basket compared to the normal three I get elsewhere. 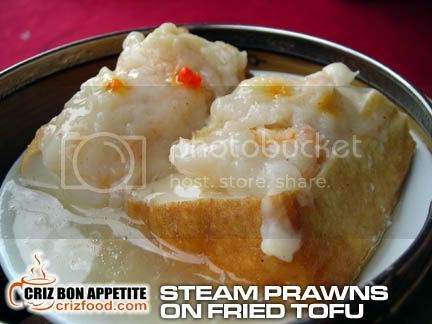 With the fresh juicy prawn dumpling served steaming hot on my table, they were one of the best around. I also realized something unique in this restaurant. They do not use Kani Kama, artificial crab sticks which have no crab meat in it but processed to resemble snow crab legs with surimi (grounded) white fish meat (pollock or hake). Most dim sum restaurants would use Kani Kama to dress each dumping differently but with the same type of filling just to impress on the look. I guessed this restaurant believed in freshness of each dim sum they serve. 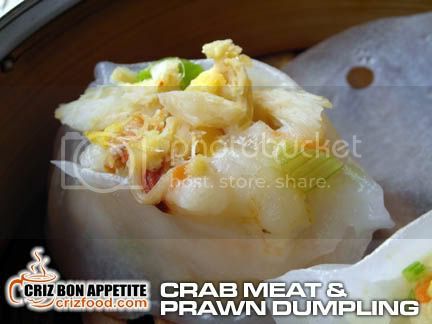 I had chunks of fresh crab meat garnished on my richly prawn filled dumpling. Moreover, it’s really cheap at RM4 for a basket of threes. The next order was something that I have not had in ages. It’s Steamed Prawns on Pan Fried Tofu and served with egg white gravy. The minced prawns were mildly flavored and the fried tofu was silky smooth. 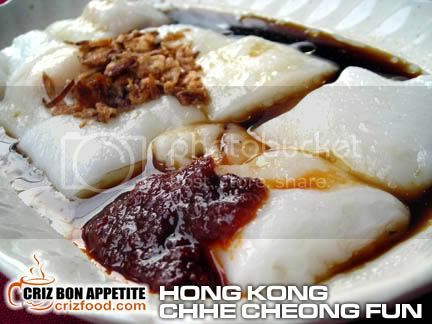 A visit to any dim sum restaurants would not be complete if you did not try out the Hong Kong Style Prawn/Char Siu Chee Cheong Fun (Rice Noodle Roll with Prawns/Honey BBQ Pork). Although the rolls were not as soft and as translucent as they should be, the tasty special soy sauce, fried onions and blended dried shrimp chili paste complimented each other well. 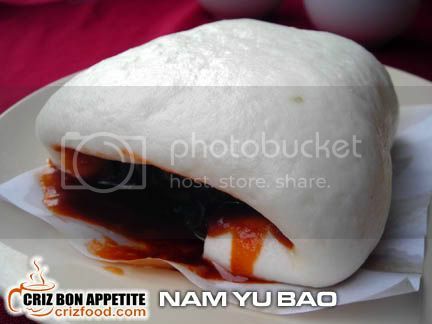 The waitress also recommended their hot selling Nam Yu Bao (Red Fermented Bean Curd Roasted Pork Steam Bun). It was superb! Choice pieces of roasted pork belly meat were marinated with red fermented bean curd, sugar, salt and some sauces and steamed until tender prior to rolling them into the steamed bun dough. These would then be steamed until the dough rose up beautifully. This is another must try in this restaurant if you love fatty meat items. The last order which was supposed to be our first order came last. It was a mistake order, not as in quality but in quantity. We did not expect our small order to end up so big. 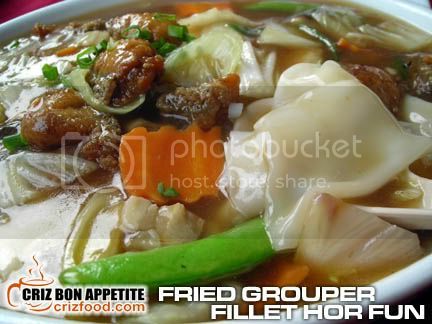 The Fried Grouper Fillet Hor Fun was enough to feed three persons and it was priced at only RM8. The dish had lots of snow peas, carrot slices, cabbages, onions, roasted pork slices on top of the generously garnished fried grouper fillets. The first taste of the gravy was beautiful but we ended up felling disgusted due to the oversized portion of the hor fun (broad rice noodles). The chef should have fried the noodles dry instead of serving them plain. That would have cut down on the soggy feeling. With our tummies being over expanded, we did not manage to try out the remaining fried items out of their over 80 types of dim sum served there. I was also being informed by the chef that they would still be coming out with new items by the end of the week. Although I did have some takeaway, it would unfair to judge them when the food had cooled down but I can assure you that the taste of the brought back items were rich in flavors. Some of the items which I could not manage to capture on shots included the Fish Bladder Prawn Dumpling and Shark’s Fin Prawn Dumpling. Gosh! Those eaters sure know how to grab good food fast. Anyway, I would just share what I had photographed below. Overall, the whole dim sum breakfast meal came up to RM30 nett inclusive of a pot of chrysanthemum tea for two. Do you think the food here is expensive then? Dim Sum Food Restaurant is just located along Jalan Macalister between Jalan Kek Chuan and Lorong Susu. 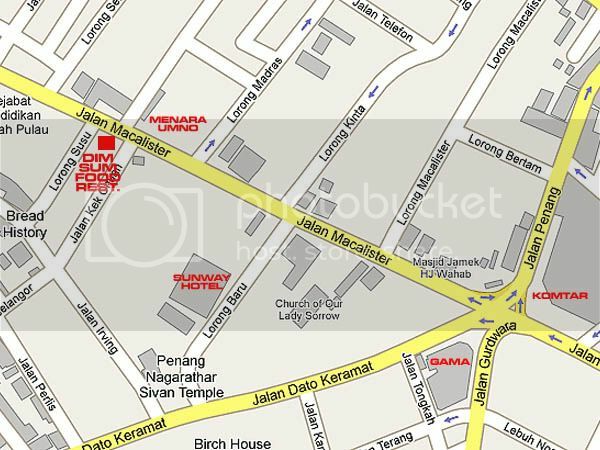 The most prominent landmark would be Menara UMNO which is directly opposite the restaurant. 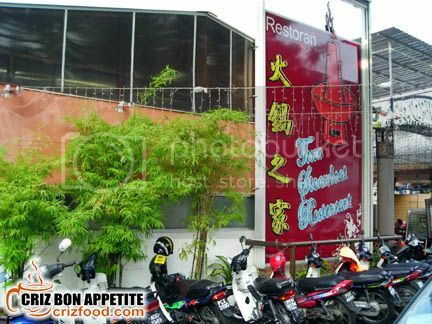 In case you might miss the restaurant, just look out for The Steamboat Restaurant sign as both share the same premises. Address: 63, Lorong Macalister, 10400 Penang, Malaysia. wa lau eh, no wonder that place was always crowded when i drove by. make me soo soo soo drooling now. You should try this restaurant too as the varieties and taste were quite similar to the one in Ipoh… if you meant Foh San Dim Sum Restaurant right? I hope they will maintain their quality that way for a long time to come. I found out that most local dim sum restaurants could not do so. Change of chef I guessed. I think dim sum in Malaysia is much cheaper than in Indonesia because it considered as food for middle – up class. Hmmm… you should have a pail next to you each time you want to visit any food sites too. Haha! As for the price of the dim sum, it also depends on what sort of quality and ingredients they use Selby. oh i’ve only been there for the bbq at night!!! You should try the dim sum too. Anyway, they are opened to 3.00pm so you won’t have excuses for not waking up on time. LOL! Oh my, I was just so enticed by their photos of Zim Sum restaurant yesterday when I was there and was thinking of trying it out soon. Hey Christy… there’s no competition here as it’s even greater if we can share even the oldest and established restaurants with our readers. First or last does not matter anyway… provided your pocket has a deeper “compartment” to store cash. Haha! hahahahaha we already attacked this place twice since we landed on Penang! lol! great Dim Sum and good atmosphere! No.1 dim sum in Penang now uh?! Oh, always go to Northam Hotel to enjoy the 50% discount. Ok, this time will try this out. Thanks for the info. got porridge and fish ball? 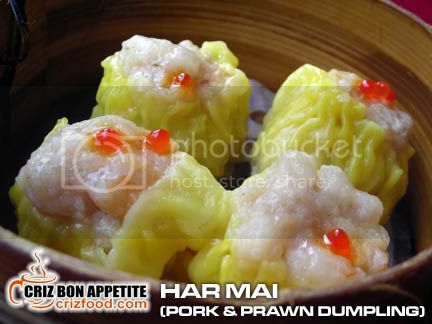 it’s my favourite when i eat dim sum..
Hi there Criz! We would like to invite you to join our Mother’s Day Contest 😉 Do drop by. yes, one of the best n good prices too! so this won ur vote aft 14 outlets??!! Yup as in overall value for money quality and taste. I still cannot ignore those small establishments which also do serve certain great dishes. try the one at anson road operate by same company but food even cheaper if i am not mistaken.opposite kdu & mgs.weekend try to go early coz very pack. That’s the mother company Ling. Food wise not bad too but the place would always be packed and the serving system there would always be chaotic, especially during weekends.